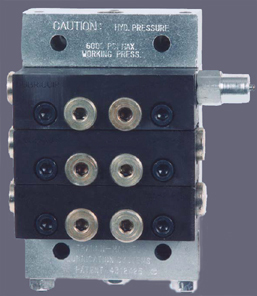 The MH divider valves operate at pressures up to 7500 PSI. They can lubricate up to 16 points from one divider assembly. They are available with either SAE or NPSF (inlet / outlet) threads. The assembly can have a minimum of three sections and up to eight sections. The discharge volume ranges from 0.006 to 0.060 in³.